The March Bonus Code Has Arrived! Summer is “marching” toward us! Get it? It’s MARCH now. Yeah. Bad puns aside, we know summer still feels miles away. But if you want to have an epic vacation, you should start saving your cash now. Plan for an amazing time and sell your used textbooks to Cash4Books. Now, when you use our bonus code cash20 you get 20 percent bonus cash on orders of $30 or more. That’s a big chunk of change! Step #1: Decide what books to sell and input the ISBNs on our Cash4Books home page. If you’re on the go, check out our mobile app and scan your books for a price quote. Download our app for Apple and Android devices. Step #2: During checkout, use our bonus code cash20 to get 20 percent bonus cash immediately added to your total if you’re selling $30 worth of books. Bonus cash is everybody’s best friend. Step #3: Print off the free shipping label and mail us your books for free. When we receive your books, you get your money. It’s as easy as 1, 2, 3. Now go get your books and plan for some summer fun. 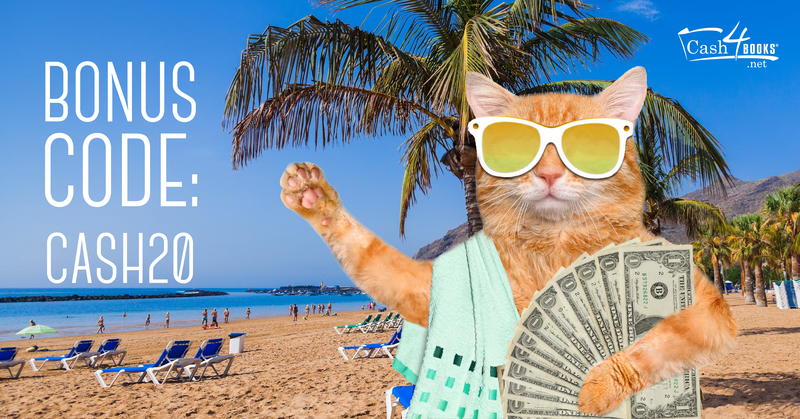 We’re dreaming of sunny beaches, palm trees, and piles of cash! Receive a 20% bonus on your next buyback order at Cash4Books.net of $30 or more. Order must be submitted by 11:59 PM PT, March 31, 2016. Maximum $200 order value. Limit 1 per customer. Cannot be combined with other offers. Cannot be applied retroactively. All books must meet the Used Book Condition Policy of Cash4Books. No cash value. This entry was posted in Cash4Books News & Updates and tagged bonus code, Cash4Books News & Updates, college students, make money on March 2, 2016 by Jim McKenzie Smith.